HOW CAN I STAY HOME TOMORROW??? Box office opens at noon...maybe i wll take a ride after church and see if i get lucky. I know they have $80 seats...but i could more easily afford a $55 one. Good luck scoring a ticket BA, fingers crossed for you ! sulky lad wrote: Good luck scoring a ticket BA, fingers crossed for you ! Thanks for your wishes sulky...they helped. A good friend came through for me. Good news, have a great evening - I'm working overnight so will be watching out for any news ! Very happy I got to finally hear You Belong to Me, another not uncommon song that I had managed to miss for 40+ concerts! Welcome To The Working Week was a shouted audience request. docinwestchester wrote: Welcome To The Working Week was a shouted audience request. Yes, not by me, and it would be a shame if that took the place of Party Girl! So are we back to seeing encores longer than the main set? 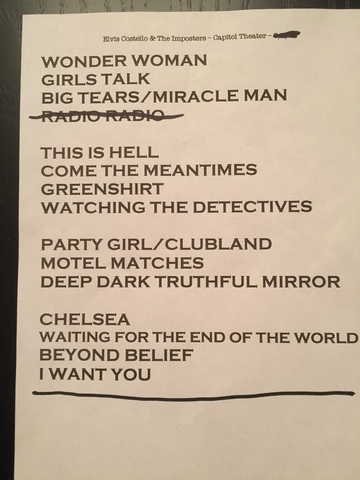 I like the setlists and it’ll be interesting to see how this evolves. I look forward to seeing how many different songs will be played from March until July. It’ll also be interesting to see if the backing singers feature in all of the shows. I'm pretty sure this was semi-setup. Like, the requester probably put his request in before the show or something. The guy was a few seats over from me. He shouted out his request in an overly complicated way and then didn’t look all that surprised when it actually got played. 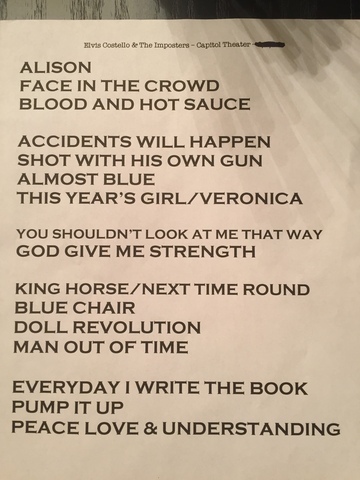 EC gave the song a pretty tentative run-through. The thought did cross my mind that it was a plant! I didn't think that at all. It was a semi slipshod run through of the 98 second song. And the band was just winging it merrily after E started it so quickly after being shouted. Then again, i am THE MOST GULLIBLE GUY EVER!! Again, if we see a video, we might know a bit more certainly.